materfamilias writes: Walkin' on Sunshine. . . and Don't It Feel Good! Walkin' on Sunshine. . . and Don't It Feel Good! I'm fiddling a bit with my schedule these days, and I may end up shifting to only posting twice a week here -- which is what I'm trying this week, a Monday-Thursday posting schedule, and I may also try a Tuesday/Friday . . . .
And as I've mentioned several times, I'm also playing around with content, seeing what might keep you coming 'round to visit but also meet my changing interests and reflect my life as it evolves. . .
After Monday's travel post, I'm firmly back in Vancouver where it's quite chilly -- a few Celsius degrees of frost (-5 when I woke this morning and the hellebore flowers on the terrace are drooping disconsolately). Tuesday morning, I had an appointment with my GP, and decided to extend the 1.5 kilometre walk there by another 3 kilometres to enjoy the blue skies and bright sunshine while doing a few errands I've been putting off. And I thought I might dress up a bit, taking the chilly temperature into account. 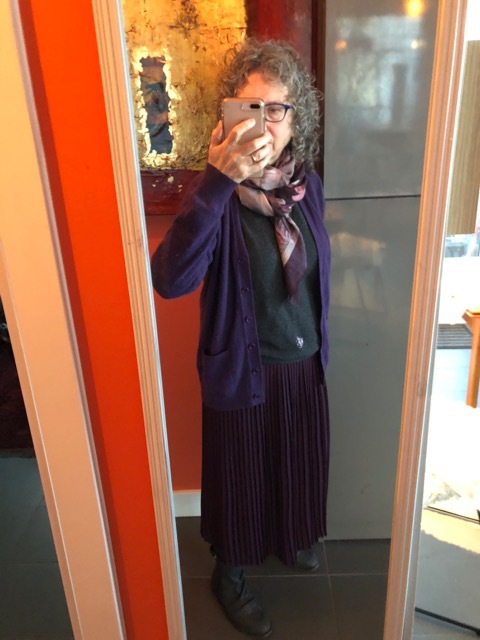 I haven't worn my Eileen Fisher pleated skirt for a while and it's not really warm enough for this weather, but with a pair of grey wool tights underneath, a layering of cashmere sweaters above, and a swath of silk wrapped securely around my neck, I was street ready. (in case you're wondering about the detail at bottom centre of that grey cashmere centre, that's the embroidered patch I made to mend a small hole.) 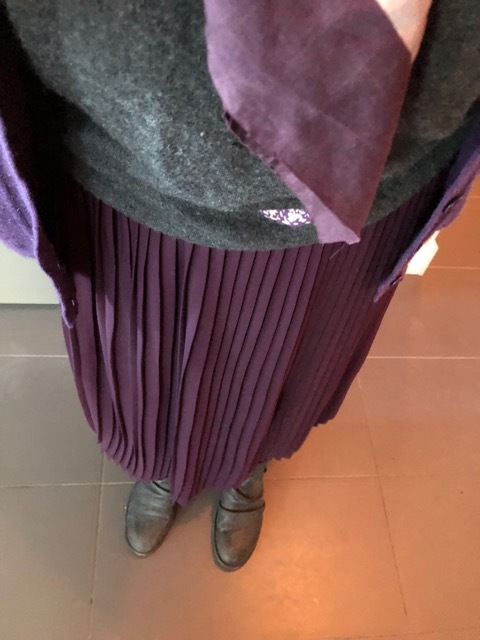 I do know that the purple of the skirt is a different purple from that of the sweater; with the scarf mixing both hues with a few other colours, I like the combination. Probably not everyone's cup of tea. 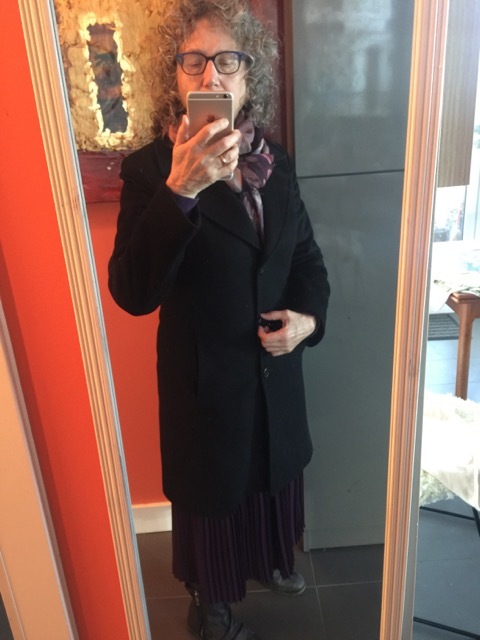 Then my wool coat over my two layers of cashmere, and I was ready to head out. . .
An efficient morning, such that I've crossed annual tests and bra fittings and face cream supplies off my list for now and I got fresh air and exercise. This is a part of city life that I truly appreciate. Even some public art to think about on the way home (and our marvelous snow-capped mountains backdropping the city). . . . 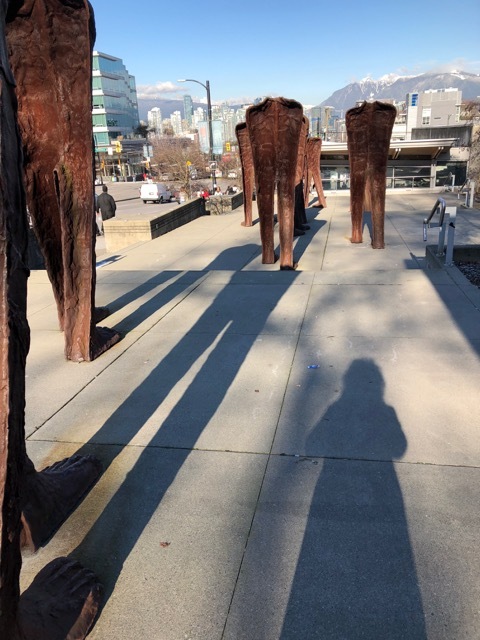 These Walking Figures -- by Polish sculptor Magdalena Abakanowicz -- might be familiar to you if you've visited Chicago where there are apparently 106 of them grouped in an installation titled Agora. 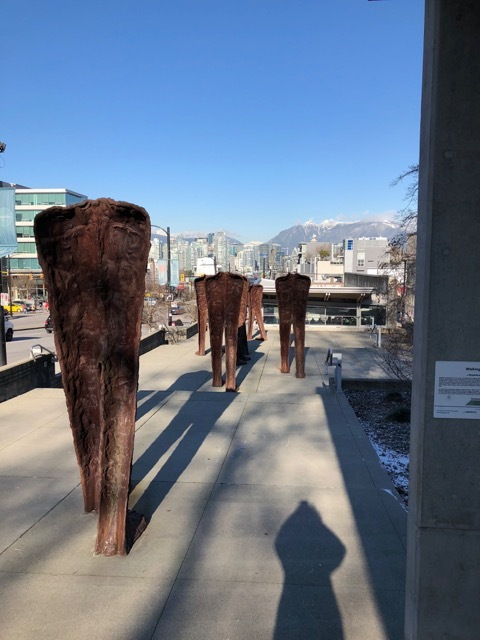 There are only nine of the cast-iron, 9-foot, headless fellows walking toward the Cambie Skytrain station here in Vancouver, but they make quite an impression nonetheless. . . Especially in bright winter sunshine when the shadows are so dramatically elongated. Even mine. . . I envy you being able to walk to things like doctor's visits! Being out in the middle of nowhere, I have to use a car to do anything. I am a city mouse and really resent being out in the country. Sometimes I don't leave the house for days at a time because there's no place to go, and going to work entails entering my home office. I think that I would come to read anything you write about. Even knitting, which I don't know how to do. Certainly writing. And art. And fashion. And travel. And your family. You are a talented writer, and a competent grammatician--a rare thing these days. It's a trade-off, isn't it? You will have the peace, the quiet, the naturally dark nights (no light pollution! ), the clean air. . . Thank you so much for the kind words. Very much appreciated. I am finding it a lot of work to maintain and monitor my ageing body. It feels annoying at times but you are right - at lease we are still able to take care of ourselves and there is enough that is still healthy to maintain. Now if I could just lose enough weight to get back into some of those nice clothes still hanging in the closet that I refuse to get rid of because I won't give up yet. I will read just about anything you write and I am grateful that you cover so many different topics. I get bored easily if it is only one subject. Thank you for continuing to blog. That weather - those mountains!! Beautiful. We're on the 5th day of damp taupe with frozen precipitation. Let's just say I'm wearing my light visor with abandon. We do enough of the soggy grey that we know to celebrate blue skies and snow-studded mountains. The frozen precipitation sounds horrid. . . Thank you for the song reminder. It will make me smile all day. And I’ve always loved the mix of refined and rough or masculine feminine. I do envy your ability to walk places but accept that my choices work for me now. 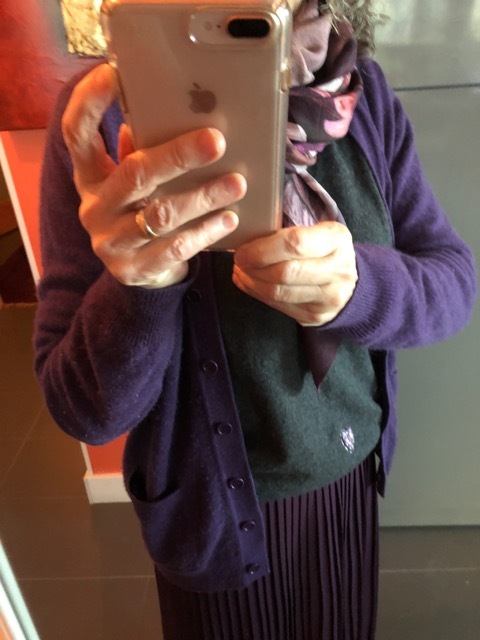 I like that lovely scarf you are wearing...it adds a splash of colour and accents the EF skirt nicely. Thanks, L. Waiting to see if we'll have to get the snow boots out today. . .
Just as others said, I will read all that you write about, even if I don’t always leave a comment. It’s the interesting mix of subjects that appeals to me. It is EB!! We're twins!! yes! (I have another in taupe, but my similar black one is the lightweight one). I like the way this neckline means it can be worn buttoned-up as a pullover -- flexible. Patch, patch, patch. Isn't that what it feels like sometimes? Think I am experiencing some slight hearing loss. Not sure that I want to do anything about it. Of course, in the US the cost of hearing aids is beyond obscene, and not covered by any insurance, which doesn't exactly provide one with the best motivation to seek a solution. On another note, as with others, envy your city walks. Happy to see you make the most of them. 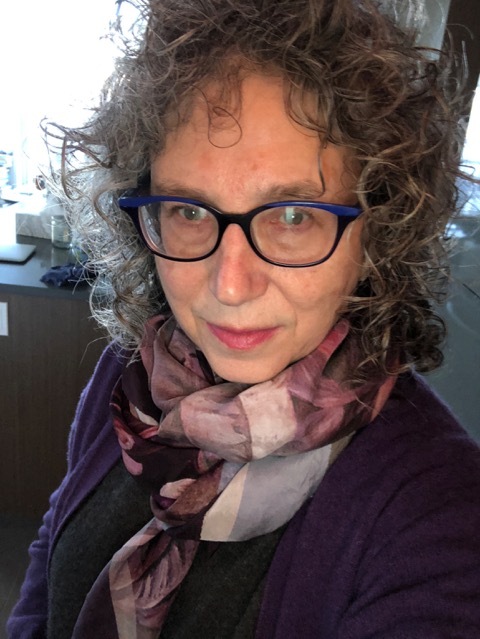 My hearing weakness is a congenital one, although it didn't become noticeable until my late 40s, and I was early to mid-50s before I finally got tested. Ours aren't covered by universal health care either (although I think there might be coverage at lower income levels) and our plan only covered $500. But I'm on my second pair ($4000, not top models, but better mid-range at the time) have now lasted 7 or 8 years, and should last a few more. The audiologist told me yesterday that he's pleased to see the technological improvements have brought up the quality of the most affordable hearing aids so much that he no longer hesitates to recommend them. So there's hope. . . I'm in the same boat as Taste of France. Love living out of the city in the summer, when walking trails are so close, and of course we're right on the river so that's lovely. But being able to walk everywhere when one lives in the city is wonderful. Having said that lots of areas of Ottawa are not walkable this time of year. On Wednesday I met a friend for lunch in our little village, and took my life in my hands walking both out to the car (our sidewalk was a perfect skating rink and instead I waded through a foot of snow which was wet but not as treacherous) and then the two blocks to the restaurant after I parked the car were ...uh... interesting. I navigated my way there by taking baby steps and mostly skiffing, shushing, and sliding. Ha. Love those walking sculptures. And your purples. I remember those mounds of dirty, ploughed snow that had to be hiked over at every street crossing (I visited Paul in winter several times when he worked in Ottawa). And the ice. And the slush. Not for me ;-) But your cross-country skiing looks marvelous when the conditions are right. We've done some here, and I like it well enough, but there are always so many hills involved no matter the assurances to the contrary. . . I have heard that it's better to get hearing aids earlier rather than later because the neurological rewiring that happens at the interpretative end of our hearing takes time and our brains are nimbler and more adaptive when we're younger. At least the stigma is lessening these days -- hearing aids are much less visible. Walking to errands, church and doctor are very important to me but I have developed a sore knee (arthritis?). I've an appointment Monday to discuss the results of the x-ray, Mum gets a pacemaker on Friday, and I need a mammogram and an opthamologist appointment. I'm working more in February because I'm away in March . Body maintenance is a nuisance. Today I feel fortunate. The day I had a routine 60-year reommended colonoscopy, however, I cannot say I enjoyed;).